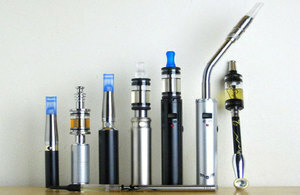 PHE’s remit letter for 2014 to 2015 requested an update of the evidence around e-cigarettes. PHE commissioned Professors Ann McNeill and Peter Hajek to review the available evidence. The review builds on previous evidence summaries published by PHE in 2014. From October this year it will be an offence to sell e-cigarettes to anyone under the age of 18 or to buy e-cigarettes for them. The government is consulting on a comprehensive array of regulations under the European Tobacco Products Directive.